Another day in Skye, another day of pants weather . 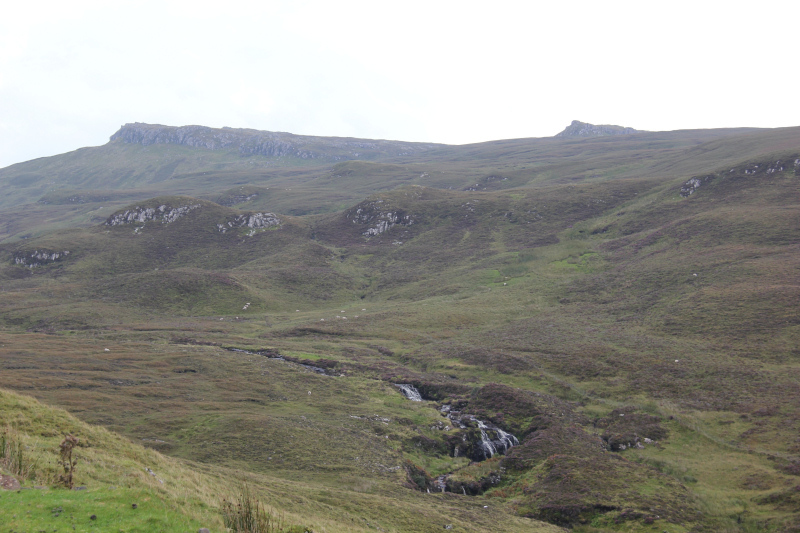 Like the day previous, I again departed Glen Brittle heading North in the hope of reaching better weather. 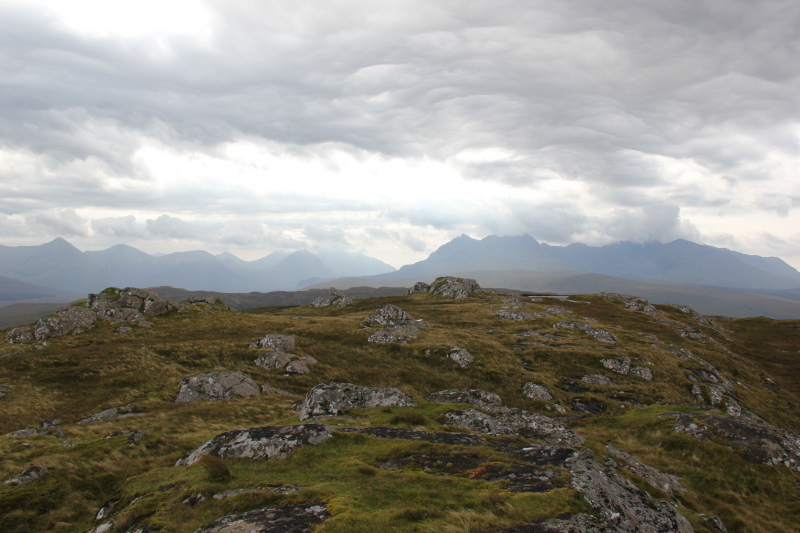 The Black Cuillin always seem to hold on to their own weather system. 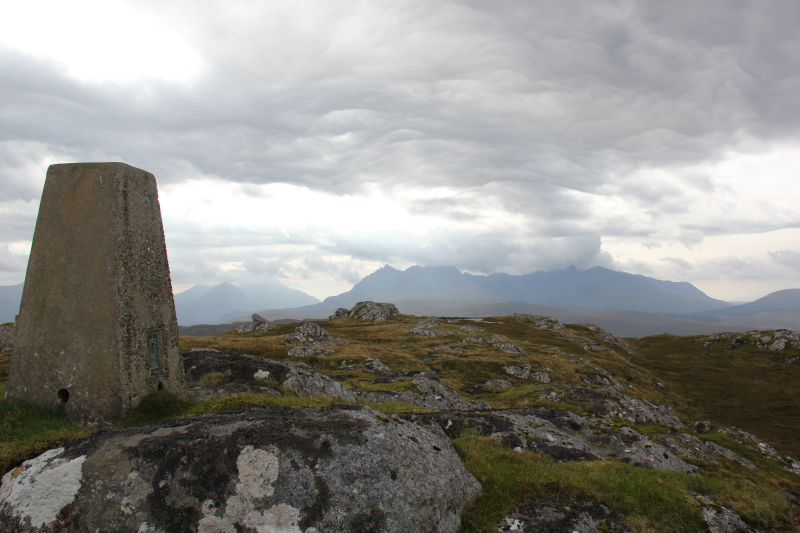 Once beyond the Cuillin, the weather wasn’t too bad . Firstly, I decided to ascend Roineval. 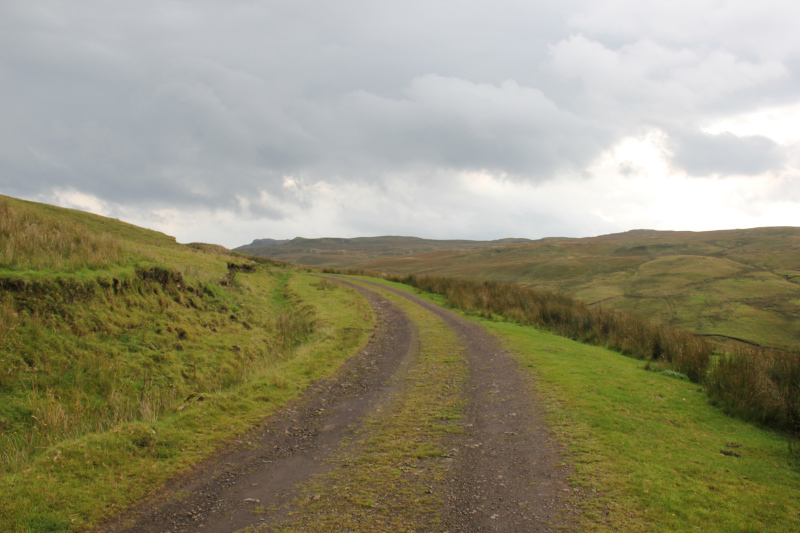 I parked in a narrow lay-by, a short distance from the start of the Brae Meadale track. 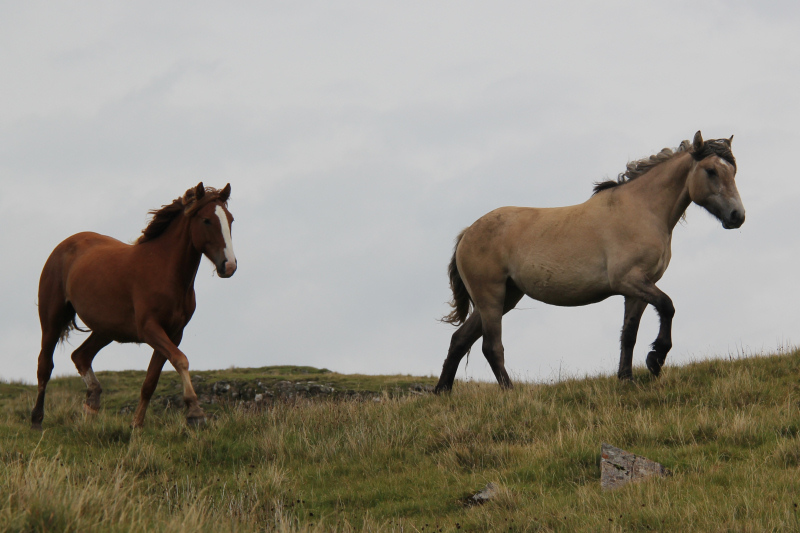 As I made my way along the Brae Meadale track, a couple of horses literally came charging towards me stopping within feet of me. The horses were too friendly, getting in the way of me progressing along the track. I had to shout at them waving my walking poles in the air to scare them away. Once safely beyond the horses, I carried on along the track to a short distance before the forest. The underfoot conditions weren’t too bad compared with some of the hills ascended in the past few days. 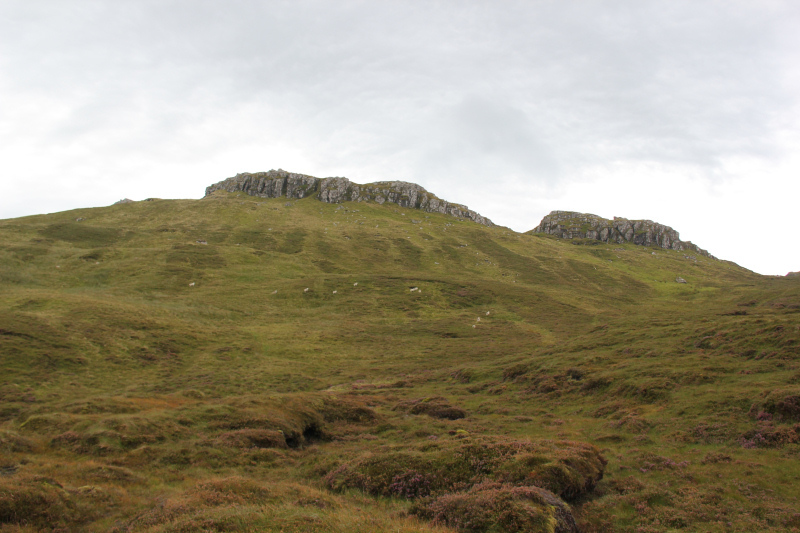 The crags on Roineval are easily bypassed on the right. It didn’t take long to reach the summit. I think there would be really good views across to the Cuillin on a blue-sky day. 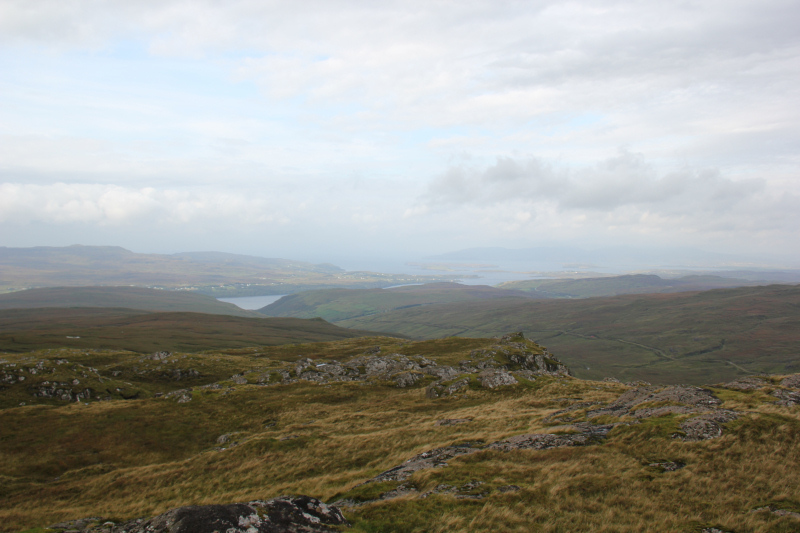 From the summit, I returned to the car via the same route. On the way back, the horses again galloped towards me, this time almost running into me. They were now more persistent. I again had to shout and swing my poles at them to make progress. Anyone ascending this hill will need to be careful around these horses. 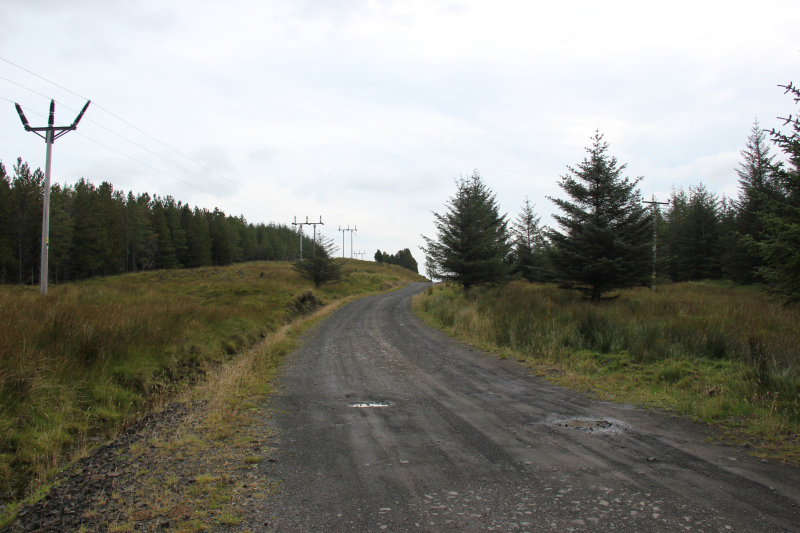 On reaching the car, I drove further along the A863 and then turned-off towards Balmeanach for an ascent of Cruachan-Glen Vic Askill. I parked at the road end. 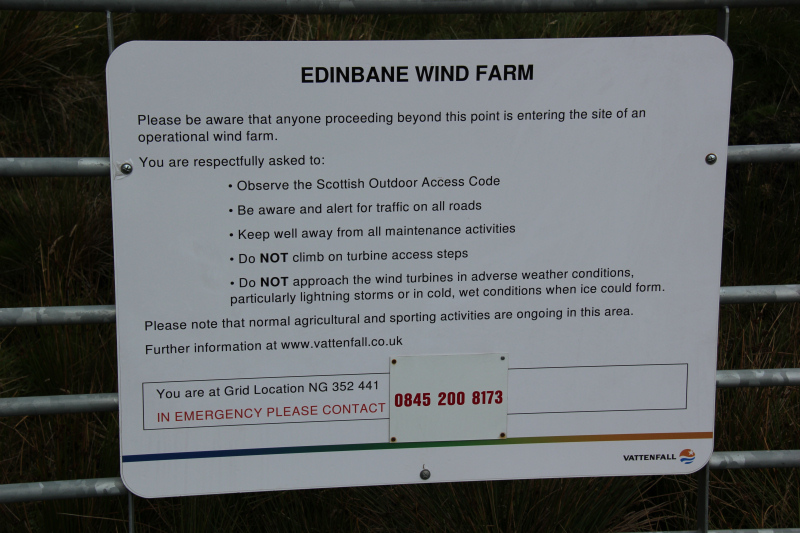 There are no gates across the track leading towards the windfarm and no signs advising, “No vehicles”. It may be possible to drive at least 2km further along the track. 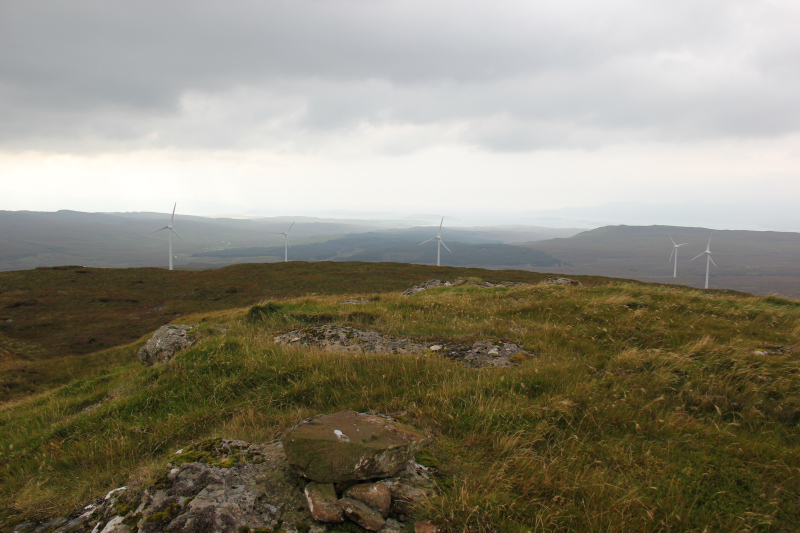 From Balmeanach, I walked along the track leading towards the Edinbane Windfarm and Cruachan-Glen Vic Askill. 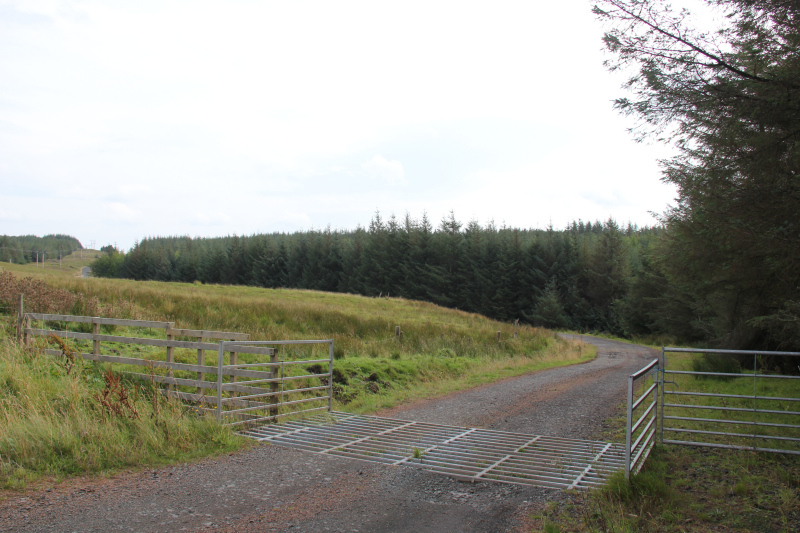 Beyond the power station, there is a track junction and a sign for a) Edinband Windfarm and b) Glen Vic Askill. I took the track towards the windfarm. 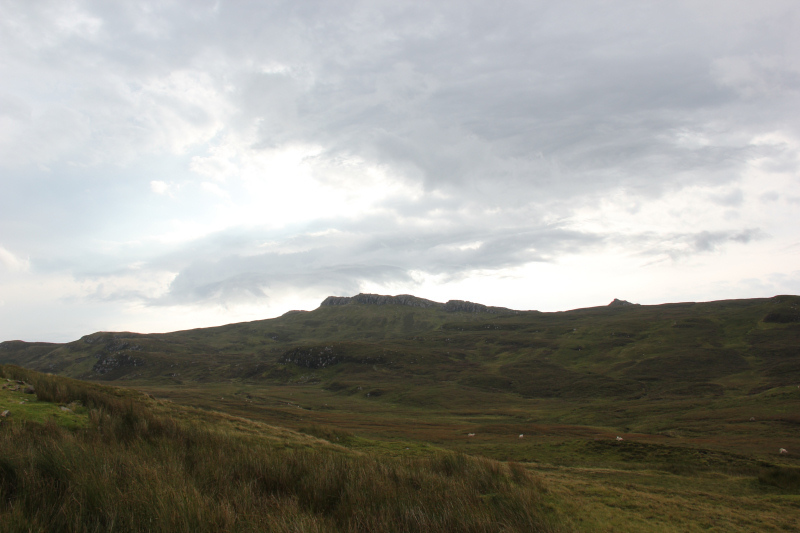 I think it is disappointing to have windfarms encroaching into Skye. 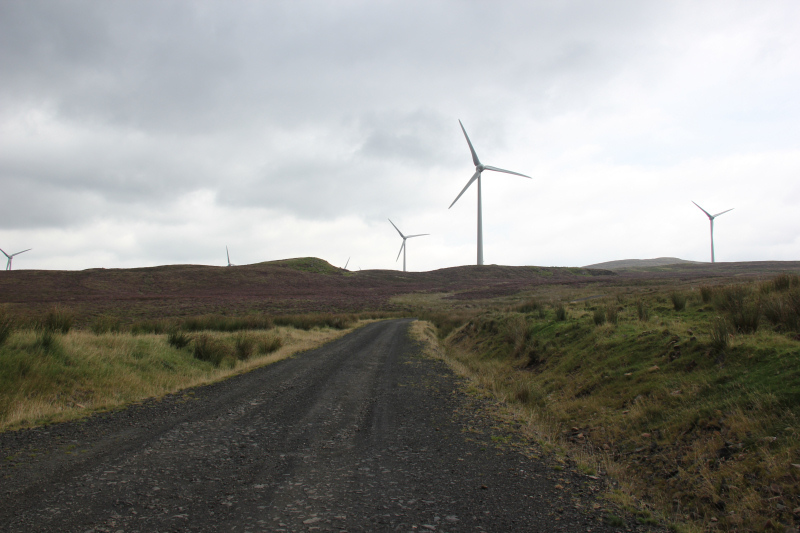 Where will the proliferation of windfarms eventually stop? On reaching the track high-point, I left the track and headed directly up the hillside towards the summit. 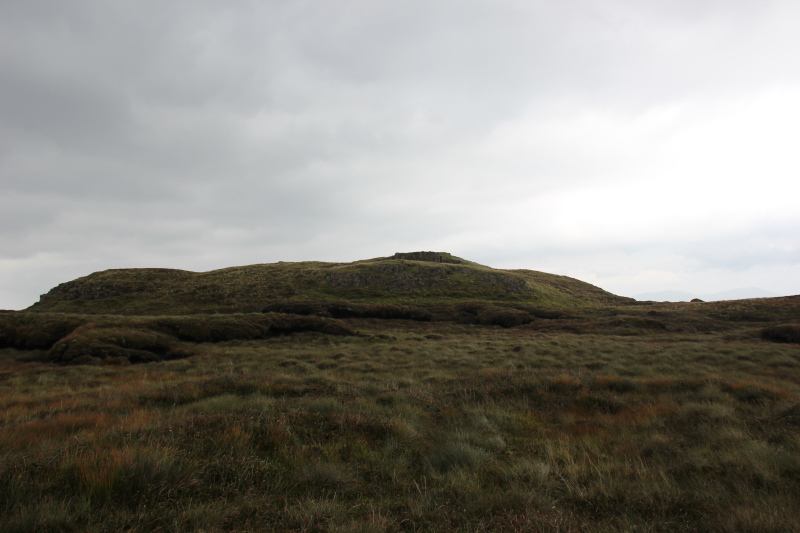 On reaching the summit, I visited the cairn and a few nearby bumps just to be sure I was at the summit. 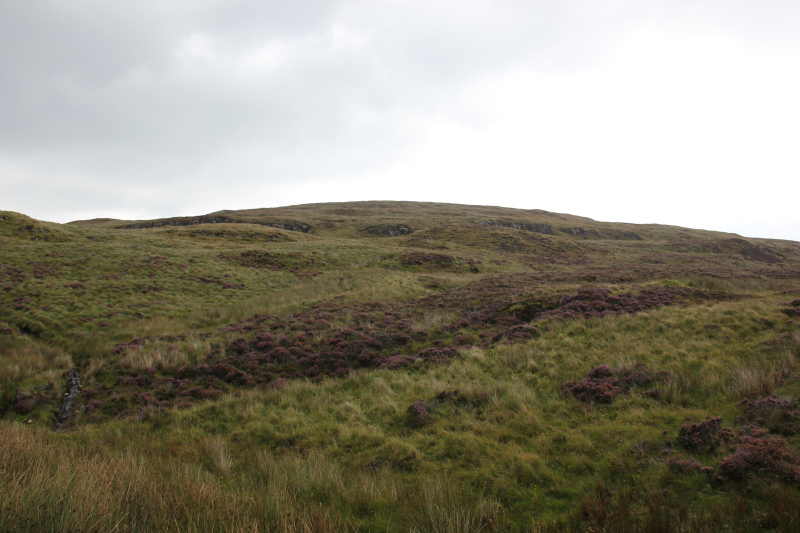 From the summit, I returned to the car via the same route, with the exception of taking a wee short-cut to by-pass the power station. I got back to the car just in time to avoid the rain, which is now again chucking it down. Nice and dry though inside the Sligachan Hotel .